Gentoo penguins live up to their Latin name pygoscelis, meaning brush tailed. 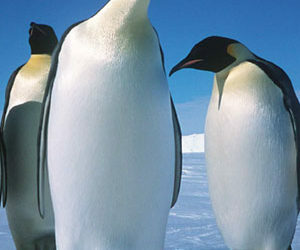 They have the most prominent tail of all penguins, which sticks out behind and sweeps from side to side as they walk. They have white patches extending from their eyes and a bright red-orange beak. No one knows where the name ‘gentoo’ came from, but they are one of the least numerous Antarctic penguins, with about 300,000 breeding pairs. Gentoo penguins are less likely to stick together than other penguins and can be found in small groups, sometimes with other species. Although they are not strongly attached to the same nest site (they have plenty of choice of sites) their pair-bonding is strong, and they usually mate with the same partner as the previous year. They nest on low hilltops or open beaches. When available, they make a nest with pebbles and other objects, and sometimes use a scrape in the ground. They lay two eggs and defend their nests fiercely. 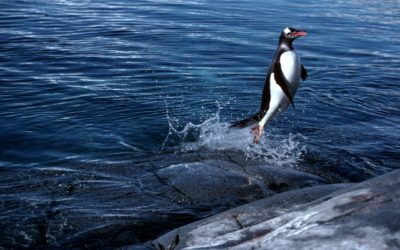 In southern locations the first and second-born chicks are equally likely to survive, but the second gentoo chick to hatch in more northerly islands usually dies. If both chicks die, breeding may take place again. Once hatched, the chicks join the crèche about a month later.